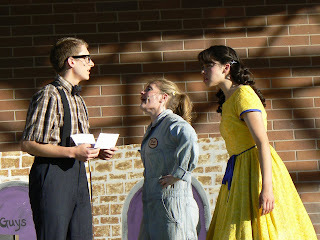 Larissa Explains It All...: All Shook Up: Article in Deseret News- Deaf People Can be in Musicals! 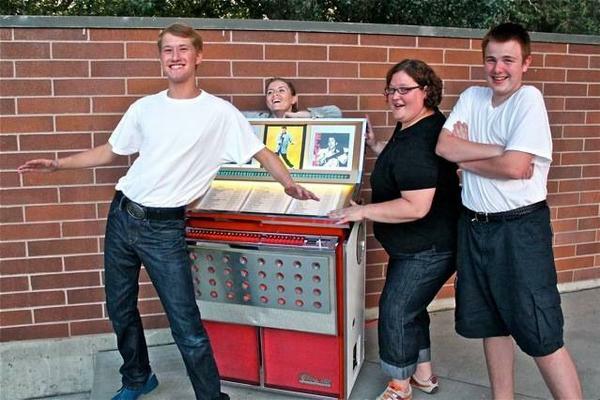 All Shook Up: Article in Deseret News- Deaf People Can be in Musicals! 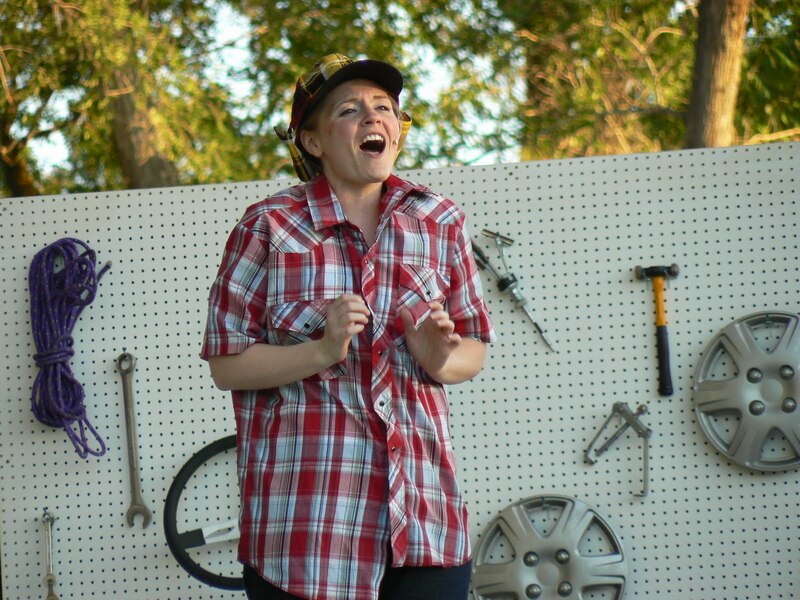 MIDVALE — Karen Chatterton, director of Midvale City's upcoming performance of "All Shook Up," says a deaf person performing in a musical is "totally possible." Sandy native Anne Fife, who is deaf, first found out about the musical when her son Nick decided to try out. He expressed his mother's interest in trying out to Chatterton, producer Stephanie Johnson and other staff members. Johnson, who was already friends with Fife, sent her a text message asking if Fife would like to try out, and she did. Fife actually sang at her audition, but at the same time explained to staff members that she would be happy perform the song in sign language if they preferred. When it came time for callbacks, Fife didn’t get a call and was ready to shrug it off. But after a little while, the cast list was up, and her name was on it along with Nick’s. They were both to be part of the supporting ensemble. Nick said they about screamed their heads off because they were so excited. They wanted to keep it a secret to surprise the family, so they rehearsed together late at night. “My personal philosophy in the arts is that they’re for everybody, and that means everybody,” Chatterton said. Rehearsal in the city park runs just like any other musical rehearsal, except two languages are spoken. Melissa Espinosa and Crystal Nichols, both volunteers from Salt Lake City, have served as Fife’s interpreters throughout rehearsals and will do so for the performances as well. They sat in front of the stage during one rehearsal with scripts in their laps practicing their parts for the community theater’s ASL nights. The musical will run for a week from July 15-22. Two of the performances — July 18 and 22 — will be interpreted for the deaf community. “Obviously, there are things I can’t really do because of not being able to hear,” she added. But Fife, the staff and cast members don’t view these as barriers. They simply had to make some little adjustments. When Fife doesn’t have her interpreters with her, she gets help from Nick or other cast members. She said she was surprised to discover just how many of the cast members knew a little bit of ASL. DeeDee Palmer, who Nick said is the most helpful with his mom, welcomed the opportunity to help Fife and brush up on her own ASL. “It makes you just understand and realize that even if you don’t have some of your senses, it still won’t hinder what you want and love to do,” Palmer said. Because Fife can’t hear the music or any of the spoken lines, it can be difficult to follow cues and rhythms. Palmer and other ensemble members give her barely noticeable physical cues like a tap on the shoulder. Her interpreters will sit in the audience to help her get back on rhythm if she ever gets off beat, but she rarely is. 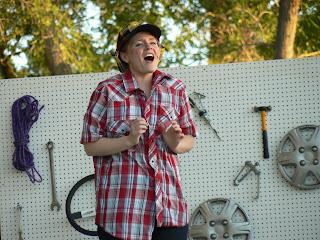 Marty Buhler, who plays one of the lead characters, Dennis, said all of the cast members have a lot to learn from Fife. Fife saves questions for before and after scenes and says that the director, choreographer and fellow cast members take extra time to make sure she understands what’s happening. Chatterton helped with writing a subplot telling Fife’s story. “It was important to us to use her in showing inclusion throughout the story,” Johnson said. The musical, based on Shakespeare’s “Twelfth Night” and Elvis Presley’s songs, centers on themes of inclusion and unity. The unity of the hearing and non-hearing worlds provided a perfect opportunity to illustrate that. 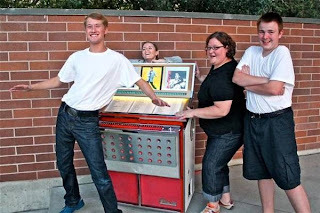 There’s one scene in particular where the cast performs the song “C’mon Everybody.” Nick leads his mom over to the jukebox so she can put her hands on it to feel the vibrations of the music that everyone else is listening to. “It’s this really cool connection moment when she starts to realize that there’s music,” Nick said. Fife then begins dancing with everyone else. Fife taught the whole cast a little bit of sign language to use in the musical number “Can’t Help Falling in Love,” and they will all sign the last line together. Fife will also participate in some of the songs by way of signing. Both Palmer and Buhler think Fife is a wonderful actress. Because sign language requires a great amount of expression, it’s not surprising that acting comes naturally for her. She’s also no stranger to performing, having been in performances with the Utah Opera and at the Black Box Theatre at the University of Utah. Fife was adamant about deaf people not being afraid to get involved. “It doesn’t matter where you come from," Chatterton said of the message of the musical. "We’re all human beings, and we all have something to offer." There’s always a place for someone, whether they can hear the music playing or not. They can certainly feel it. For more information about the performance and tickets, visit http://midvalearts.com/.